For many people, the need to record daily routines and happenings in a paper journal has been replaced by Twitter, Tumblr, blogs, Facebook, and email. If you wonder what you were doing on March 23, you can do a quick search or your Gmail inbox, check your Wordpress blog, or scan that day’s social networking posts. But sharing with an audience can produce vastly different records than a private diary entry to yourself. Per Se does its best to approximate on the Mac the old school pulp and ink journaling experience, while adding in some very cool features that could only exist in a digital notebook. It is not a tool for managing or parsing a stream of complex ideas. Instead, it is an uncomplicated, intuitive little application that just wants to know how your day went. Per Se has three design options that resemble an open book. The left side of the page starts with the date, followed by a blank space for you to fill up with thoughts. Those thoughts aren’t limited to text in Per Se—you can add images or snap a new one with your iSight camera (there are even a few fun photo filters you can apply), record audio or video, throw in a design or emoticon from the application’s library, or add a note that looks like a sticky note or torn sheet of paper. The text itself can be formatted to include tables, lists, and checkboxes. If you fill up the page, it takes you to a fresh one instead of scrolling down. 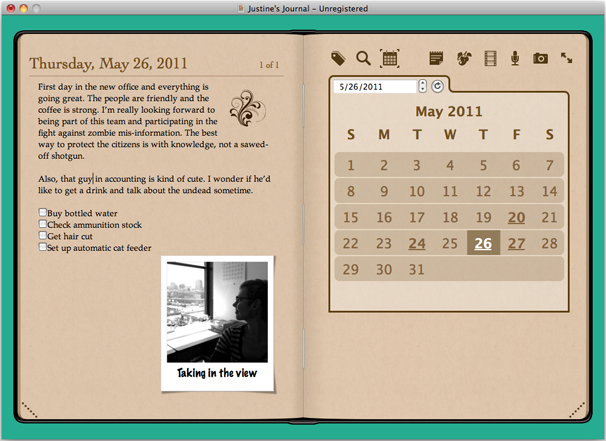 On top of the right-hand page are controls and navigation options. There are buttons for inserting all the multimedia goodies we mentioned above, but also key organizing tools. The Bookmarks/Tag tool allows you to add custom tags or bookmarks to any entry in your journal, useful for keeping track of all your brilliant idea (tag: Idea) or characters in your life (tags: mom, dad, Enrique). The calendar icon opens up a month view, and each day that already has an entry is underlined. Click to jump to another date. The Search/Browse option allows you to search entries by tag or any keyword. The size of the book is fixed, but you can switch to the mis-named full screen mode, which actually just fills the rest your screen with the book’s accent color. It does help minimize distractions, but using the additional real estate for actual words would be more helpful. There’s one major drawback to Per Se: It has very limited export options. You can print a day’s entry to PDF or export it as a RTF file. But you can only print or export do one date at a time, so if you decide to switch journal applications or make a printed version of your year’s thoughts, you’re out of luck. The developer has promised to add more export options in future updates.